Now reading Susan Choi's A Person of Interest, about an Asian professor, Lee, a mathematician at a midwestern university, who becomes a person of interest in the investigation of a mail bomb that kills a computer science professor whose office just happens to be next to Lee's. Novel was partly influenced by the real-life case of Taiwanese professor, Wen Ho Lee (who was acquitted of charges brought against him at his place of work), according to the book promo. 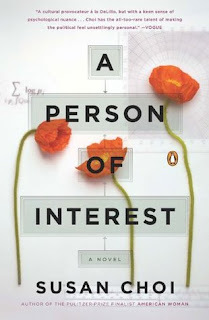 I'm impressed by her writing in A Person of Interest and her skill in getting us involved in the intricacies of her main character's thinking and how he might be perceived by others around him. Choi's 2007 novel, American Woman, was a finalist for the Pulitzer Prize last year. She is, by the way, part Korean and part European American, but born in Indiana.